History | Gwrach Ynys, Snowdonia Bed & Breakfast, (B & B), Accommodation near Harlech North Wales. The Welsh language is spoken by the majority of people in Snowdonia, and most of us conduct our daily lives through the medium of Welsh.. It is the oldest spoken language in Europe and came to Britain over two thousand years ago with the Celtic tribe, who migrated westwards from central Europe and settled over much of Britain. With the coming of the Romans the language co existed with Latin for five hundred years, but with the invasion of the Anglo Saxons the Celts were forced westwards taking their language with them. Two strands of the tongue evolved with the Gaelic being spoken in Ireland and the high north of Scotland. From the Scottish lowlands down through Cumbria, Wales, and the marches to Cornwall, the spoken language was Brython. Though, by the 15th century the language had retreated to Wales and Cornwall, many Welsh names like Glasgow, Strathclyde, Malvern and Dover show how widespread the language once was. Many of our guests are pleasantly surprised to hear how widespread the use of the language still is in the area. Here are a few words and phrases to get you started. Please have a go; its fun and it will be appreciated by the locals. Remember that Welsh is pronounced phonetically, with every letter sounded. Man, over many millennia, has made his mark on the local landscape. 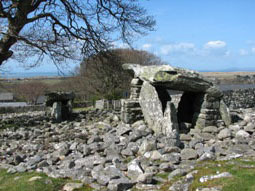 Bryn Cader Faner, one of the best preserved bronze age burial sights in Europe, lies on the hill a couple of miles from the house, and there are many prehistoric settlements and burial cairns, many joined by a ten mile bronze age path. When walking these ancient paths one often wanders how life must have been like for our forefathers who walked the same ways all those centuries ago. Harlech Castle, completed by Edward 1 in 1287, as part of the iron ring of castles around North Wales, still stands imperious on its rocky outcrop. Owain Glyndwr, the last prince to rule an united Wales, held a parliament here in 1404, and later the brave stand of the defenders during the Wars if the Roses was commemorated by that famous march of the Men of Harlech. During the civil war the castle held out in the Royalist cause and was the last castle in Britain to fall. Apart from Edwards' castles there are several native Welsh castles, well worth a visit. The tranquil setting of Castell y Bere near Abergynolwyn, to the south, belies its turbulent past, and Dolwyddelen castle, built by Llywelyn the Great stands sentinel at the head of the Conway valley. Dolbadarn castle, in Llanberis, was also built during this period, and is also well worth a visit. 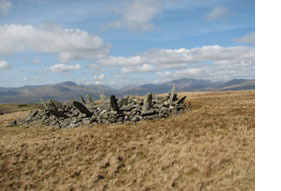 Another link with the civil war can be found a few miles away in Llanbedr at the head of the lovely Nantcol valley. Maesygarnedd farm was the home of Cromwell's brother in law John Jones, who signed the death warrant of Charles Ι, and was to pay for this on the scaffold on the return of Charles П. One very tangible links with the past are the old drovers roads. Over the centuries these brave and hard men would drive animals and birds to the markets of England and return with money and goods to bolster the economy of a very poor area. It has been passed down in local folklore that the peasant farmers would exist on gruel whilst sending their animals to grace the plates of the landed gentry in the prosperous south. Over time the drovers expanded their businesse to carrying money and setting up banks and also providing safe passages to people who were scared to face long journeys to London on their own. This allowed many drovers to become rich men in their own right. 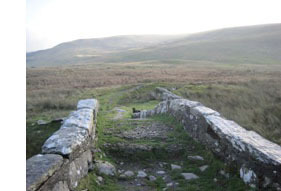 Probably the most famous drovers way in the area is the track over from Harlech to Dolgellau using the old bridge Pont Scethin.